With 15 additional stores and restaurants, you'll be able to create shopping centers that no longer need offices, apartments or hotels to draw in visitors. From sunglass stations and toy stores to salons and video game arcades, a wide variety of new retail and dining options await you. 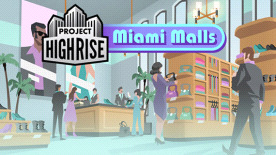 The bus terminals and train stations in the Miami Malls content pack bring even larger crowds to fill your malls and shopping centers. Observation decks draw in droves of tourists who might just stop by a food court or a souvenir shop while they're heading up to take in the panoramic city views. What's a mall without water features? Towering mall fountains look their fanciest when flowing in front of new arched glass and steel lobbies. And don't forget the tropical flair with decorations and wallpapers themed to match the new Miami Malls stores and restaurants.